Forest Frenzy Video Slot Review - Casino Answers! 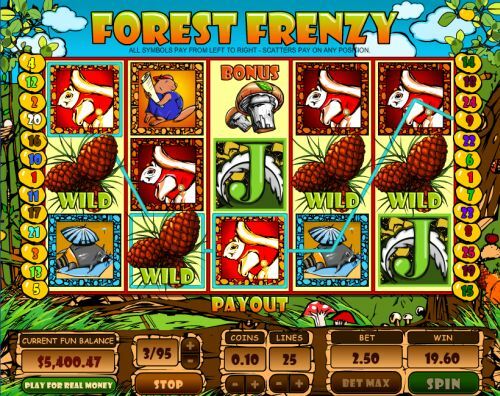 Forest Frenzy is a 5-reel, 25-line video slot developed by Top Game, featuring a wild symbol, a free spins feature and a bonus game. You can play the Forest Frenzy video slot at Bovada. The Forest Frenzy casino game is a penny slot. Bets on the Forest Frenzy slot machine are $0.01, $0.05, $0.10, $0.25, $0.50, $1, $3 and $5 per line. You can select up to 25 paylines on the Forest Frenzy slot game. The maximum total bet on the Forest Frenzy online slot is $125, which is a good betting range for most online slots players. To play the Forest Frenzy video slot, select your bet and hit the “Spin” button. To select all 25 lines, use the “Bet Max” button. The King symbol is Forest Frenzy’s top-paying symbol. If you hit 5 King symbols on a selected payline, you will win the 4000 coin top jackpot. The next highest paying symbol is the Queen symbol, which can pay out 800 coins. The wild symbol is the Pinecone symbol. The Pinecone symbol will substitute for all symbols except for the scatter and bonus symbols. The scatter symbol is the Acorn symbol. 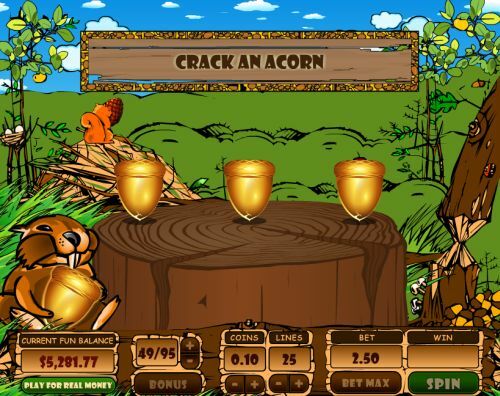 If you hit Acorns on reels 1 and 5 at the same time, you will win 5 free spins. You can trigger free spins and the bonus game at the same time. You can win free cash from this feature when you play at Bovada. Payouts are displayed on the Paytable. All symbols pay from left to right, except for scatters. Scatter wins pay on any position. Free spins feature wins are multiplied by the bet and added to payline wins. The Forest Frenzy slot machine has a basic autoplay mode. Press the “Auto Play” button to access the autoplay controls. You can use the “+” and “-” buttons to select anywhere from 5 to 95 autoplay spins (in increments of 5). Press the “Start” button to begin the autoplay mode. Choosing the autoplay feature will automatically play the games consecutively using the selected bet and line amounts. To stop the autoplay mode at any time, press the “Stop” button. If you’re into wildlife and furry little creatures, you will enjoy the Forest Frenzy theme. The Forest Frenzy video slot also has free spins and a bonus game, so it’s good for special features. You can play the Forest Frenzy slot game today at Bovada! Can players from the USA play the Forest Frenzy online slot for real money? Yes, players from the United States are welcome to play the Forest Frenzy video slot for real money at Bovada. Is there a Forest Frenzy flash game that I can play? No, you must download the software at Bovada to play the Forest Frenzy video slot.